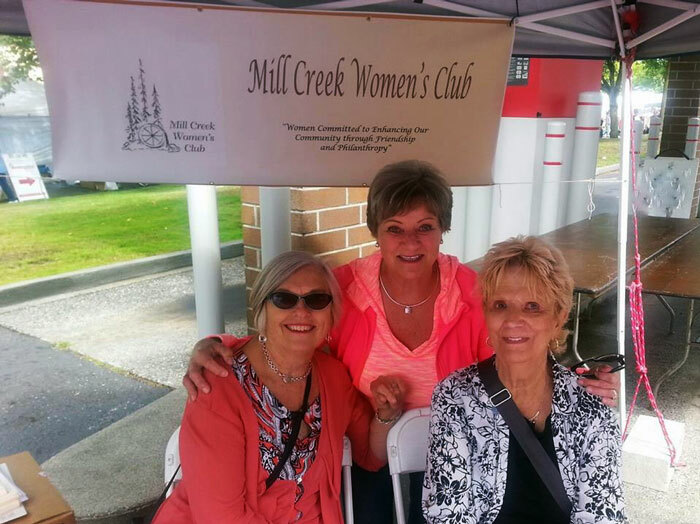 Women’s Club members at the 2016 Mill Creek Festival booth. Photo courtesy of Mill Creek Women’s Club. The Mill Creek Women’s Club is planning another busy year in 2018/19 – starting with our booth at the Mill Creek Festival July 14th to 15th. Information on the club activities will be available at the booth for anyone who is interested in learning what we do or is interested in becoming a member or a sponsor of our club. If you cannot attend the Festival or would like additional information, email us at membershipmcwc@gmail.com. The Mill Creek Women’s Club is open to all women living in the greater Mill Creek area. Our Club’s Newcomers’ Brunch will be held in early September. This event is specifically for new or prospective new members. It is hosted by the Governing Board and will be held on a date and at a location to be announced. This is an opportunity for anyone who is interested in joining our Club to meet other members and learn about the Club’s activities. For more information, contact Ardean Armitage, Newcomer Chair, at ardeanardean@gmail.com. Year round, the Mill Creek Women’s Club operates the Working Wardrobe boutique at the YWCA in Everett. The volunteers from the Club help women of limited means to find appropriate clothing for job interviews, work and school; they receive and sort donations and make sure the inventory is seasonally appropriate at all times. Accessory items such as costume jewelry, purses, shoes and toiletries are available through the Working Wardrobe. Obviously, the Mill Creek Women’s Club isn’t on summer vacation!